I have been making pizza at home for years but have never been totally satisfied with it - particularly the crust. It never seemed to develop the taste or texture I was looking for. Along came Arthur Schwartz with his great cookbook “The Southern Italian Table”. His recipe for the dough requires an overnight rise in the refrigerator and that makes all the difference. He also uses far less yeast which I thought might detract from the flavor but that is not the case. His recipe gives 16 ideas for toppings which, I am sure, will help inspire you to create your own. One which he did not mention - probably because it is not authentic - but which I had in a restaurant in Vermont, is a pear and gorgonzola topping. Different, but delicious! At least 30 minutes before mixing the dough, in a minimum 2-cup liquid measuring cup, sprinkle the yeast on ½ cup of the water. Wait a minute, then stir with a fork until the yeast is dissolved. Stir in ½ cup of the flour. Set aside at room temperature and let the mixture increase to at least double, about 1½ cups. Combine 3 cups of the flour with the yeast mixture and the remaining 1 cup of warm water in the bowl of a stand mixer fitted with the dough hook. Mix on low speed until the dough just begins to mass together. Add the salt, and continue to knead the dough with the dough hook until it looks smooth and the machine struggles a little. Stop the machine. Gather the dough into a ball and turn it out onto a lightly floured work surface. Knead the dough for another 5 minutes, folding and turning it onto itself as demonstrated in the video, adding just enough flour as needed to keep the dough from sticking. 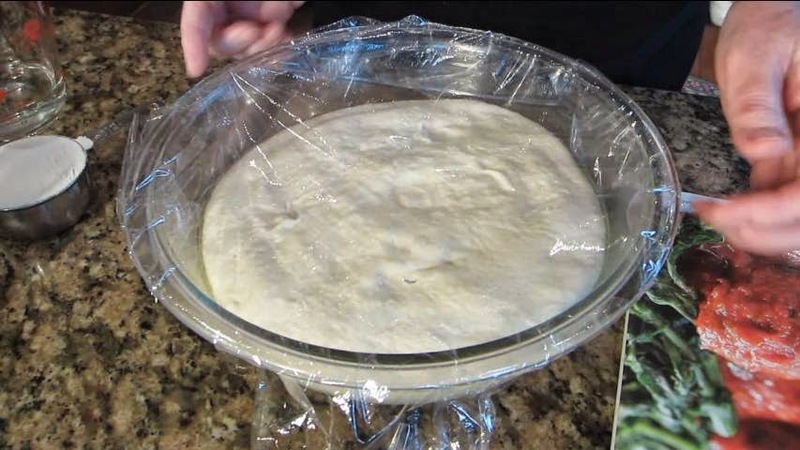 Lightly oil a medium sized bowl, place the dough in the bowl and turn the dough over so that all surfaces are coated with oil, cover with plastic wrap and place in the refrigerator overnight. Remove from the refrigerator. Allow to rise until doubled - this will take up to two hours, depending on the temperature of your kitchen. After an hour, turn your oven on to 550º. Deflate the dough by pressing it down, then divide into 3 parts. Each will make a 10 to 12-inch pizza. To form the pizza, flatten a ball of dough into a thick disk. On a lightly floured surface, rotating the disk as you go, flatten the center of the pizza with your fingertips or the heel of your hand. When a ridge of dough starts appearing on the perimeter of the disk, lift the dough up with both hands, and holding onto the ridge, let gravity and the weight of the dough stretch the circle. Keep turning the dough to get a relatively even 10 to 12-inch circle. Keep pulling the ridge slightly so the circle gets larger. Be careful not to make the center too thin or the ridge more than a ½-inch deep. Alternatively, you can use a rolling pin. Spread the formed pizza dough onto a paddle lightly dusted with cornmeal. If you don’t have a pizza stone, place the formed dough on a lightly floured cookie sheet. Top as desired and bake for 8 to 10 minutes depending on your oven and the topping and how well baked you like pizza. For many years, I’ve also had so very many disappointments regarding pizza dough that I pessimistically thought that your system wouldn’t work. I was pleasantly surprised, that, following your instructions, except leaving the un-risen dough in the refrigerator for 2 days (as opposed to over night), it turned out GREAT. I guess the moral of the story is to never question the abilities of Betty Busciglio. P.S. You are also good in front of a camera (I assume that this ability comes along with the Scottish blood).